With 10 instruments between them and 53 strings to tune Otter Creek burst onto the national Folk scene in 2012 with back to back hit albums on the Folk Charts. Since that time they’ve seen a TV placement on the season 6 finale of TLC’s Sister Wives, and the top single of their current album “The Fiddle Preacher debuted at #10 on the Folk DJ charts. 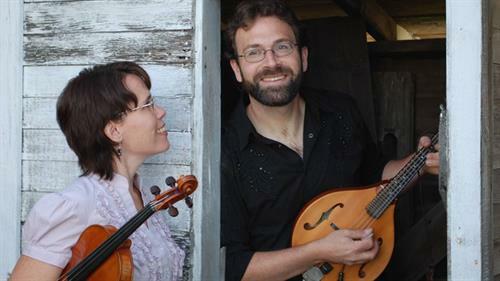 Otter Creek has won multiple awards for their virtuosic instrumentals, adept songwriting, and visionary arrangements of traditional and original tunes. They have drawn praise from around the country leading one critic to describe them as “a duo that is both a technical marvel and tastefully perfect.” They use their “superb musicianship underpinned by stunning technique” to perform “songs that appeal to the heart and mind as well as the ear.” (Greg Harness, Rootsworld Magazine). Otter Creek’s classical training, combined with Peter’s deep roots in the folk tradition enable them to cross musical boundaries. They are also sought after session musicians. They have opened for acts such as Claire Lynch and The Shook Twins. In addition to their polished sound as a duo, Peter and Mary’s daughters, (The Three Muses) often appear on stage with them. Drawing frequent comparisons to the Peasall Sisters their three part harmony and infectious charm never fail to put a smile on every face in the room. Recent and upcoming performances include: The Liberty Theater (Astoria, OR), Tom May’s nationally syndicated “River City Folk”, The Walnut Valley Festival (Winfield, KS), Utah Arts Festival (Salt Lake City, UT), The Florence Folk Festival, (Florence, OR), SLCC TV “Brewin’ Bistro”, The Tucson Folk Festival (Tucson, AZ), Groovefest (Cedar City, UT), and the IAMA/Gallivan Folk and Bluegrass Festival.